Identity theft is on the rise, and fraudsters are coming up with more and more sophisticated ways to cheat individuals out of their hard-earned money – even dead people! An email comes through advertising the perfect job – home working, no overhead and fantastic pay. You send off a detailed email listing all your personal information. An email comes back saying you’ve been successful, and asking for a photocopy of your passport to rubber-stamp your identity. You send it off – and you’ve successfully given your identity to someone else. Don’t fall for this scam – if it sounds too good to be true, it probably is! The last six weeks you’ve spent searching for affordable Timberland boots, which normally cost about £150. Then you find the perfect pair online for just £45. You use your credit card to smugly buy the coveted purchase, then wait for the boots to arrive. Problem is, they never do. Next time, only use a website you trust – such as John Lewis. 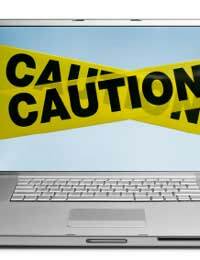 Don’t buy online if no UK contact number is provided, and be on alert if the grammar and use of English looks dodgy. Facebook, Twitter and even LinkedIn are fantastic ways to make new friends and get new work contacts. Trouble is, it doesn’t always work that way. Many people aren’t cautious enough when it comes to social networking, posting all their personal details online without a worry. This leaves you open to identity theft thieves, who can harvest all your information to their own personal financial gain, and even infect your computer with malicious spyware. Be careful what you put online, and only “friend” people you know. An email purporting to be from your electric company asks you to update your account, so you fill in personal information including your name, address and bank details. Next thing you know, £500 is missing from your bank account. Legitimate companies with whom you have accounts will not ask for that information – they already have it! It sounds ghoulish –and it is! Identity theft of the deceased involves fraudsters getting detailed information from a letter or an obituary to access a bank account, or get personal credit from an online source. Ask the major credit agencies to put a “deceased” flag on the accounts of your departed loved ones, and avoid lengthy obits. Identity theft is rife amongst fraudsters who pretend to represent a legitimate charity, then take the money for themselves. Sometimes they set up a charity that sounds eerily similar to the real thing, or they run a fake website pretending to be a non-existent one. Some small-scale scammers even go door-to-door asking for money. Ask to see the charity registration number, and check with the Council to see if door-to-door solicitors they are legit. Not shredding or disposing of bills properly can lead to criminals raiding your bins, then using the information they find to raid your bank account. Invest in a shredder and use it to shred all potentially sensitive documents, especially those with your name, address, signature and bank details on them. Fraudsters illegally copy information from the magnetic strip of either your credit or ATM card, then use the information to steal your money. How can this happen? Easily. A shop assistant takes your card out of sight, a device is attached to the ATM machine, they then swipe your card through several times. Be vigilant and report anything suspicious. When someone nicks your wallet, you might think that cancelling all your credit cards is all you need to do. Wrong. Identity thieves now have the tools to wreak havoc with your accounts – and your credit rating. Request account changes for all credit cards (just cancelling them can affect your credit rating). Ask that a fraud alert be put on your account with the big three credit rating agencies, report a missing driving licence and file a police report. A flat for rent is advertised that looks inviting, often at an absurdly low price. Before viewing, the “landlord” asks for proof of funds. The potential tenant is then asked to transfer the first month’s rent to a friend before being allowed to view the property. The landlord asks to see the receipt, then uses it to access the funds at the money transfer agency. Remember, legitimate landlords will never ask for money transfers to be completed before the deal has been clinched; they will run a credit check on prospective tenants. Identity theft tricks are on the rise, so don’t become a victim yourself. Know how to protect yourself, your property and your possessions, before it’s too late. How about this one? You notice a job when job searching on a legit page like Monster or Totaljobs. The application process is the same as a genuine job and you go through a 'recruitment' agency (in reality, a member of the scam team). They then select you for the details to be sent to the Director of the position! Now, the reason you applied for the job is because its abroad and you liked that idea. Hell, the company will include the flights if you are successful! So, you are narrowed down to interview and you go to the interview with the manager. After a rather genuine interview, you are later offered the job via email (it must be a legit offer; they put it in writing). Of course, we're going to need to book the flights out for you. We'll arrange your accommodation there and per salary benefits though we need to get your flights done now. So please send us your passport details and your NI Number, now that you are our employee, and you will start work in Malta on Thursday 16th January. Congratulations. I look forward to working with you. Of course, you now send those details; you have a job offer in writing and are about to start work! (You have just been scammed). My husband has just had alot of money taken out of his account by a ltd company who say they had his authorisation to take it - trouble is we had never even heard of them until this happened. What can we do to get our money back?? ?